Staring intently out on Channel skies. Impervious to pounding waves and winter storm. Resist and spurn the bitter lapping brine. Or where they can relieve themselves alone. Declining fish trade and the road to war. Snails, mussels, garlic, frites instead of chips. While thwarting tourists with their camera phones. Could she be looking to France or Belgium’s shore? Where Cornelia Parker chose that she should lie. Upon the drying beach when tide withdraws. A friend and confidant to all that vow. Stately and brave at England’s coastal gate. A better use of time I could never dare to claim. The coast of France gleams and bids bonne nuit. One of these days I might manage to walk past this place. But it’s not likely to be anytime soon. For a start, you can’t miss it. The attractive magenta, cyan and yellow (you can tell I use Epson printer cartridges) frontage in itself will cause all but the most rushed tourist or day tripper to stop momentarily, smile and ponder whether they should while away an hour inside. Ready for the Big Switch On! The huge picture window of the upper (magenta) level of this independent coffee house near the top of the Old High Street in Folkestone allows that unsuspecting passer by to peer more closely at the interior, and marvel at the walls crammed with books of all ages and sizes. They will also observe the VIPs among the clientele who have snagged the settee and armchair in that window. Despite the fact that many complain that they feel in a goldfish bowl once they are ensconced there, they are never in a hurry to vacate the space, and when they do, there is always a civilised clamour to assume residency. And after all, it is the best people watching spot in Folkestone! The scholarly feel continues when you place your order with the welcoming staff. You become temporary custodian of part of the book collection with a number on the cover to identify your order, a twist on the ubiquitous wooden spoon. This morning I am handed a copy of The Faithless Lover and other Poems by Leonard Ley – no intended reflection, I’m sure, on my character, but, nonetheless, I shall move swiftly on. I take my seat at the small table behind the settee. This is the best place to write as it provides an element of privacy and just enough space for laptop, phone, coffee and plate. And there is a tasteful lamp for reading purposes and the beautiful double-sided screen made exclusively for Steep Street by Zimbabwean born local artist Thurle Wright to stare at for inspiration and worth the visit alone – perfect. I await my ethnically sourced cappuccino and brie, parmesan and tomato quiche, just one scrumptious item on a menu that includes the most luscious cakes as well as tasty paninis, salads and sandwiches, all prepared, baked and cooked on the premises. There are plenty of vegan options too. I spot a small girl, maybe three years old, dressed head to toe in pink, hurtling excitedly down the cobbled hill, while her frantic father strains to grasp her hand before she rolls down into the harbour. Should he fail, I am at least reassured that it is low tide at the moment. Civilised, animated conversation is another attractive feature of life at Steep Street, and today is no different as it reverberates around the split level layout. Leonard Cohen’s untimely death, announced earlier this morning, vies with Trump, Brexit and the imminent new series of I’m a Celebrity Get Me Out of Here (I made this last one up) as the main topics of discourse. All is calm and unhurried. Even the background music (Paul Simon as I write this) is soulful and unobtrusive. A bedraggled mutt (I think he must have been for an early morning dip in the Pent Stream) sidles up to me and engages in a couple of minutes’ foreplay that entails the licking of hands and coyly turning its head away when I try to stroke it, before settling at my feet and catching the crumbs of my quiche as they – accidentally on purpose – escape from my plate. Spotting the Grateful Dead lightning bolt and teddy bear stickers on my laptop, his owner begins to reminisce (as far as he can remember) about his involvement with the Deadhead community in the U.S. in the eighties. This leads to a conversation about his attempts to bring traditional Irish music to the town. We debate the respective merits as venues of the Leas Cliff Hall, with whom he already has a meeting arranged, and the Quarterhouse on Tontine Street. I assure him that there is an audience within Kent and recommend the latter as the more appropriate (and crucially smaller) venue. On his departure, his place at the adjoining table is taken by the Member of Parliament for Folkestone and Hythe, Damian Collins, whom I had only come across the previous day at the Folkestone Jobs Fair. I introduce myself as one of his new constituents and exchange a few words about the recently launched business hub on West Terrace. As a fellow devotee of Steep Street the man clearly has some taste, and his campaigning for Remain in the EU Referendum endears him to me still further. But I wouldn’t vote for him. A young couple with extensive facial piercings sit at the corner table and extract their laptops from their satchels, rendering the upper level a scene from an Apple interns’ breakout room. Or at least it would if Mr Collins, and especially I, didn’t double the average age. As I stand and rummage in my trouser pockets for £2.60 for another cappuccino, one of the young women serving behind the counter informs me (and the customers around me) that the man that I had been talking to previously had, on leaving the cafe, paid for a large drink for me. I am delighted and humbled by the gesture, or at least I would be if I weren’t so darn embarrassed too. 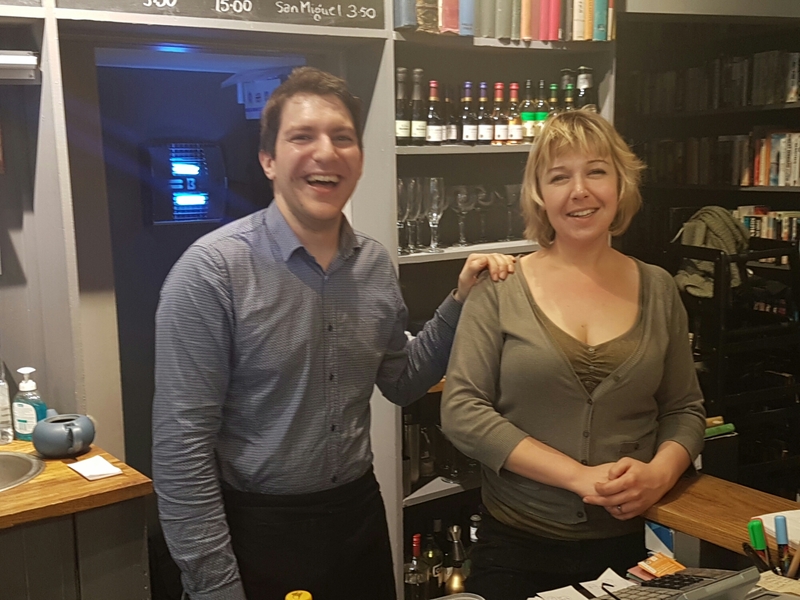 The charming owners, Stephen and Alice, are committed supporters of the upcoming Folkestone Book Festival, sponsoring illustration, flash fiction and “short and tweet” competitions, as well as publishing a magazine containing the best five entries in each category. During the event itself, they are hosting creative writing and poetry workshops. In many ways they will be the epicentre of the entire festival. Steep Street’s reputation as literary linchpin of a town increasingly defined by its artistic offering (the next internationally celebrated Triennial is scheduled for next year), is enhanced by the provision of “blackboard” tables upon which customers, primarily, but not exclusively of the milkshake rather than flat white persuasion, can chalk their own artworks. A rare opportunity to nab the best people watching seats! The same pink-spattered child observed earlier had thankfully avoided a watery, or rather muddy, grave following her hair raising downhill run on the cobbles, courtesy of a relieved Daddy carrying her back up the hill. In celebration, she tips the tumbler of coloured crayons on the table and sets to work. Witnessing the resulting, naturally pink (or is it magenta? ), Christmas tree exposes my own artistic shortcomings and I resolve to offer to pay a surcharge next time I’m obliged to sit at that table. My signature art piece since the age of three, and still serving me well / ill (delete as appropriate) are matchstick men and women wearing top hats, and in the case of the latter, the additional, creative touch of equilateral triangle shaped skirts. The self-styled Folkestone Poet stands stoically in his accustomed spot outside the Big Boys Fine Burger Co. restaurant directly opposite Steep Street. His sales technique entails whispering to passers by while waving three copies of his verse collections gently in the air, hardly likely to secure him a retail job, but quietly appropriate for his role in the town’s life . Most of those who stop tend to smile sheepishly and scurry off without making a purchase, deterred by a combination of price and content, but I find his work refreshingly direct, full of gallows humour and the most idiosyncratic spelling. And there are occasional flashes of heart rending poignancy. My incipient bromance with Damian Collins attains a new level of intimacy as he buys a copy, though a cynical fellow patron speculates loudly whether he will claim the £3 back on his parliamentary expenses. But he could be right. Regardless, I think he’s a “top bloke”. But I still wouldn’t vote for him. After two large cappuccinos and a (small) bottle of Pinot Grigio, I resolve to take advantage of the fast improving weather outside and drag myself away. My decision is rendered even easier by the arrival of three young mothers with babies and associated paraphernalia who pounce on the settee / armchair combination in the window vacated by an elderly couple and begin to spread out. It may be a long time before those coveted seats become available again. My final duty is to adjudicate among two middle aged ladies who cannot decide which of the enticing cakes adorning the counter they should indulge in. After some discussion about the relative merits of the blueberry vanilla sponge and raspberry and chocolate cake, they take my advice and plump for the lemon cheesecake, which, judging by the moaning and smacking of lips I hear as I open the door to leave, has been one of my better decisions. If you live in or near Folkestone, are a young mum, aspiring writer or lady that lunches (other socio-economic groups are available), and have not tottered down the Old High Street in the past year, you are missing a treat. Most of my summer holidays between the ages of ten and eighteen (when I became too cool to trail behind my parents) were spent in the once fashionable seaside resort of Folkestone, a gull’s glide along the coast from the fabled White Cliffs of Dover. Although there was only one small, inevitably packed, patch of sandy beach along its largely pebble and shingle seafront, the magnificent Rotunda amusement arcade, fringed by fairground rides, putting green, boating lake and swimming pool, kept a young boy handsomely entertained for two weeks in August. Just occasionally, the vacation coincided with cricket at the Cheriton Ground where the county team hosted opponents from what appeared then to be exotic, faraway places such as Derbyshire and Northamptonshire. My parents would install me in the stand around 10 o’clock in the morning and head for the shops, bars and arcades. Equipped with sandwiches, suncream and scorebook, I drooled over the godlike exploits of Cowdrey, Knott and Underwood. The sun always seemed to shine and Kent always seemed to win, though I’m not convinced that the history books corroborate either assertion. In the absence of “the summer game” in town, I could be found being blown around the pitch and putt course on the windswept cliffs overlooking the small but bustling harbour, where saucers of fresh cockles and whelks were in abundant supply. If the cliff top links seemed too challenging, a round of crazy golf could be had on The Stade, the narrow strip of land between the harbour and the East Cliff (now Sunny) Sands. The family, who went by what, to a ten year old in 1963, was the hysterically funny name of Clutterbuck, not only ran our bed and breakfast on Foord Road, but also the kiosk selling buckets, spades and fishing nets at the beach end. Finally, there was a daily ferry service to Boulogne-sur-Mer in Northern France, where I spent my first few hours on foreign soil. Unfortunately, my recollections of a youthful life on the ocean wave have more to do with leaning over the side of the boat depositing what I hadn’t eaten, than tucking into a full English breakfast in the café below deck. It was several more years before I could indulge in what became lifelong passions for croissants, Roquefort cheese and Burgundy wine. Folkestone may not have enjoyed the cheeky, “kiss me quick” ambience of Margate or Southend, but I loved its quieter, more refined atmosphere. My parents even spoke on occasion of retiring to the resort but, sadly, it never happened – and with my father’s recent death, never will. I’m comforted, however, by the thought that the last break they shared together was in their favourite location (where they thoroughly enjoyed their stay in the much maligned Grand Burstin). And now my wife and I have means, motive and opportunity to live that dream ourselves. We have been frequent visitors to Folkestone and the other Kentish seaside towns of Herne Bay, Margate, Ramsgate, Broadstairs, Deal and Whitstable in recent years, and loved each for its particular attractions and atmosphere. But when it became apparent that my father’s life was approaching its end, I asked her which resort she would like to make her home should circumstances one day permit. To my surprise and delight she replied, without hesitation, “Folkestone”. So now we are presented with the small task of selling two homes in Medway and buying a property on our favoured part of the coast. It is a daunting, but undeniably exciting prospect. At the moment of that fateful decision six months ago, I announced that I hoped we would be able to take up residence by mid to late summer of 2016. And it isn’t going to be for want of trying – even our customary lengthy foreign holidays might need to take a back seat this year. So, apart from the obvious charms that the recollection of childhood still wove, what is it that has lured me to Folkestone? After all, the past forty years have seen the town, in common with many other resorts around the British coastline, decline dramatically as a holiday destination as people took advantage of extended leisure time and the resources to travel abroad. The rotunda and surrounding attractions have long been demolished, the lively, cobbled Old High Street that winds up to the modern town centre fallen into disrepair and many of the businesses dependent upon holidaymakers closed. Even the Sunday market on the rotunda site lost its appeal for the hordes that had once descended upon it from all parts of the county. Gone were many of the shops selling postcards, beach balls and buckets and spades. Gone were the traditional tea rooms and fish and chip restaurants. Gone were the abundant amusement arcades where I might while away hours on the Roll a Penny, Skee Ball and Coin Pusher games. And gone was the shop with the big picture window at the top of the Old High Street, through which generations of children and adults alike had gaped in awe at luscious sticks of Folkestone rock being mgically brought to life. But, with extensive investment, much of it courtesy of a notable sugar daddy in Sir Roger de Haan, there have been signs in recent years that the resort is beginning to stir again. The Old High Street has undergone a makeover. One of a kind gift shops, artisanal food stores, and trendy restaurants are emerging, along with a burgeoning artistic community focused on the Creative Quarter. There may no longer be any cross-channel services, and the former harbour railway station remains overgrown with weeds, but the town’s accessibility from London and the rest of the county has been enhanced by the arrival of a high speed rail service, reducing the journey to the capital to under an hour. And, of course, it is home to the Channel Tunnel and the swiftest escape to the continent. The East Cliff beach has been re-branded Sunny Sands and is as rammed as it ever was with humanity on a warm day. And there are few better places to play beach cricket when the tide is out. And, during the summer of 2015, the Harbour Arm, after years of abandonment, re-opened for several weekends with live music and eclectic food and drink outlets decorating its bracing promenade, providing “new” thrilling vistas back across the harbour. Closed for the winter, it is scheduled to resurface on a larger scale in May 2016. So our permanent residence could not be better timed. For me, however, the jewel in Folkestone’s crown (only just ahead of the harbour) remains the Leas, once described as “indisputably the finest marine promenade in the world”, a wide clifftop walk with lovingly tended flower beds and glorious views across the channel. Imposing old hotels speak of the resort’s former glory, none more so than the Grand and Metropole, though now they provide private apartment living. The Leas Cliff Hall is a popular stopping off point for musicians and comedians on tour. I will never forget a hilarious and seemingly never-ending night in the company of Frankie Howerd there during one of those wonderful sixties’ holidays. On a clear day, you can almost pick out individual buildings on the French coast as you walk past Mermaid Beach en route to the charming neighbouring resorts of Sandgate and Hythe with its access to the world class attractions of Port Lympne Reserve and the Romney, Hythe and Dymchurch Railway, still the smallest regular light rail system in the world, and as thrilling a ride more than a half a century after the first. At the end of the line, you arrive at Dungeness on the tip of Romney Marsh with its remote beauty (and venue for all night fishing trips with my uncle fifty years ago), and where the abundant birdlife share the shingle with two nuclear power stations and an elegant lighthouse. Dover Castle, Canterbury and Ashford Designer Outlet are all a short drive away. Despite the loss of the ferry service and crazy golf course, as well as the diminution in the fishing trade, the pretty little harbour and adjoining Stade with its seafood stalls still retain some of the atmosphere that first captivated me fifty years ago.The Guardian newspaper recognised the efforts being made to enhance Folkestone’s appeal by rating it among the world’s best holiday destinations to visit in 2014. Many, especially those who had not visited in recent years, might snigger at the idea, but the town is showing signs that it has a future. Twelve months, two house sales, one flat purchase and much frustration and spasmodic heartache later, we took up permanent residence in Folkestone in early August, on schedule with my wishful prediction when the decision to move here was made. And every night over the dinner table we have interrogated each other as to why we hadn’t done this many years before. But, of course, there were a number of viable reasons (or were they excuses?) – proximity to ageing parents, financial constraints borne of a meaty mortgage and a bank-busting propensity for expensive, primarily American, holidays, or maybe it was just unwarranted caution. We might have settled into our new apartment a month or so earlier had our sellers – now, let’s put this kindly – not taken a more relaxed approach to moving than us. Firstly, they refused to let the estate agents have a set of keys, insisting that they show prospective buyers around their property themselves. Their prerogative, of course, and they did afford us nearly an hour of their time on two separate occasions, making us tea and establishing a strong personal rapport (or so we thought). However, the fact that they engineered a seven week gap between those two viewings and prevented the surveyor from examining the apartment for a further month thereafter, explained by a combination of work commitments and regular retreats to their French holiday home, proved immensely frustrating and stressful, by contrast, as progress on the sale of our house in Gillingham proceeded smoothly. Moreover, half way through the process, and completely out of the blue, their solicitor delivered an ultimatum to us to the effect that we pay a non-refundable deposit of 1% within 24 hours or they would pull out and place the property back on the market. Disaster was averted by the estate agent persuading them that fairness dictated that they put up a similar deposit. An open-ended exclusivity agreement sealed the deal, barring subsequent major catastrophe. We had viewed eight other properties in the West End of town, none of which remotely matched up in terms of visual appeal, character or size. Once we had seen the property on Radnor Park and submitted an offer at the asking price within five minutes of leaving the viewing it, we were determined that it would be ours. We even took a significant financial hit following the survey on our own house to secure it. We have already bought a new washing machine (to replace the one that had served us so well for twenty years) and our first king size bed, incurring the wrath, in the process, of two teams of delivery men doomed to lug them up those aforementioned stairs. I know it’s their job, but we felt a little guilty as we witnessed the grunts and groans that accompanied the manipulation of the items round and over the bannister at each level. My contribution, such as it was, was to supply the occasional burst of brute strength (again an attribute not commonly associated with me). The washing machine is working well. It even seems to know when the clothes haven’t quite dried and takes it upon itself to add a few minutes to the cycle. Modern technology eh? Despite assertions before the move that our Virgin Media services would be installed within a few days of our arriving in Folkestone, we were then informed that we would have had to wait three weeks before we have an operational landline, broadband or TV in the apartment. Consequently, we did not see a single minute of the Olympics or the start of the Premier League season – oh, and I must not forget the soaps (my wife instructed me to include that). That said, we did catch up with a lot of movies and television series on DVD that we have not seen for years, or, in some cases, not even taken the outer sleeve off! We had planned to head out west in late September for a few weeks. This was diluted to a week in Italy as the exchange rate plummeted following the EU referendum (I refuse to use THAT word). Now, we have decided to stay at “home” and acclimatise ourselves to our new surroundings. After all, there is a sense that we are still on holiday and staying in somebody else’s apartment, but I’m sure that will recede as autumn and winter approach (or will it?). Now that another month has passed, and with the climate gods continuing to shine upon us, we are beginning to feel that this is now our permanent home. The frustrating saga of our landline, cable and broadband installation is finally over after forty two tortuous days. Hold on, the more discerning among you will exclaim, you said it was being completed after three weeks. And you would be right. The engineer duly arrived (very late) on the appointed date and immediately announced that he was unable to carry out the job because he would need a longer ladder (you couldn’t make it up), and he had not been informed that we lived on the second floor (the company was fully aware of this). This resulted in a further three week delay before our services would be installed. No amount of pleading, complaining or threatening on our part could bring the appointment date forward. The more observant reader would also have wondered why, in the absence of cable television coverage, we did not invest in an indoor aerial and take advantage of the Freeview channels installed in any modern appliance. But only after four weeks! And, again, that was my wife’s idea. But the saga is now well and truly over. We have now, in addition to the aforementioned bed and washing machine, purchased a new fridge/freezer and oven, perpetrating an epidemic of hernia repairs among local delivery men in the process. My wife has settled into her new office in town. We are on first name terms with two pair of crows that have taken up residence in our beech tree. They love nothing more than to join the ducks in the fishing lake and the gulls on the roof in a chaotic (pre-) dawn chorus. Our collection of eateries and watering holes continues to rise, with the Cliffe Restaurant in the View Hotel quickly becoming a favourite. And we have entertained guests from Norwich and Philadelphia. For now then, it is fair to say that the fabulous Folkestone fairytale continues. 2 Folkestonians appear to care for their physical surroundings too – flower displays and other open spaces are lovingly tended, littering is less visible than in many other places I have lived in and visited and there is extensive renovation and redecoration of buildings going on, especially near the seafront. I am very conscious, however, that Folkestone is no more immune from the contagion of drunkenness and lawlessness that infects town centres across the country. The recent attack on a group of innocent bystanders in the early hours of the morning in Sandgate Road is not the only such incident since we have been here. I will not shy away in future from highlighting negative as well as positive features. As the council gardening staff begin to dig up the flower beds along the Leas under another limpid blue sky that belies the reality of today’s Autumn Equinox, my thoughts turn to the next six months. Most of the time I have spent in Folkestone, as child and man, until now has been during the summer or in the late spring. But whilst I might mourn the imminent passing of hot, sunny days, I am excited at the prospect of witnessing winter storms crashing (but not damaging further) Coronation Parade and walking from Mermaid Beach into Sandgate and Hythe on cold, crisp February mornings. The next phase of our Folkestone story awaits!